Around 40 locals joined forces with volunteers from local businesses and council staff to stage a community action day in Huyton. The community-minded volunteers spent the day planting saplings, pruning trees and hedgerows, clearing pathways, installing owl boxes and painting railings in the Swanside area of Huyton. Local venues which benefited from the makeover included St Bartholomew’s Church where overgrown vegetation was cleared, Swanside Community Centre and St Margaret Mary’s Junior School. 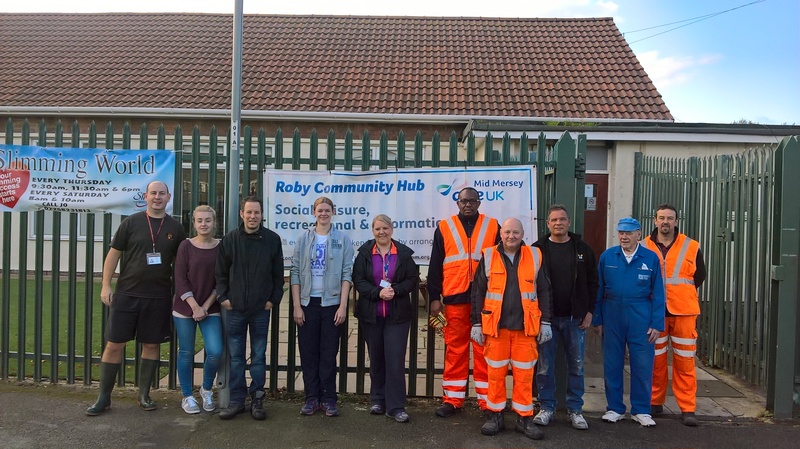 As well as painting the Roby Community hub building, workers from property maintenance company Novus Property Solutions also provided training to young people on the Community Payback scheme. Companies also involved in the clean-up were the Assist Group, Network Rail, CAS Environmental Services, and SSE. Knowsley Council’s street scene teams were also on hand to remove discarded waste from St Bartholomew’s churchyard. A ‘thank you’ to all involved.